You are here: Home / Grace on Parade / Is Thanksgiving A Dying Holiday? November is coming. November means Thanksgiving and the beginning of the holiday season. Thanksgiving is a great way to start the Christmas season. It puts me into the frame of mind to be grateful for the greatest gift of all – Jesus Christ. Yes, I find it pretty disgusting too that as soon as some folks push away from the Thanksgiving table, they’re off to the mall to stand in long lines at their favorite store, not necessarily to buy gifts for others but to get that deal on the latest and greatest toy they’ve always wanted. Some stores, as other posters on Facebook point out, dare to even open their doors on Thanksgiving Day, hoping to reap in early returns on Black Friday revenue. Workers at stores can’t stay home with their families if shoppers are crowding the aisles on Thanksgiving Day. I don’t like it either. 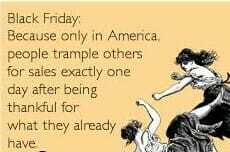 I’ve been one of the main opponents of stores open on Thanksgiving Day. Isn’t anyone thankful anymore? But let’s be fair. Let’s not judge too quickly. The poster accuses people of being thankful one day and greedy goblins the next day. We don’t know what is in the heart of other people. Maybe those who push and shove their way to get what they want weren’t very thankful in the first place. Here’s something else to think about. Just because stores open on Thanksgiving Day doesn’t mean people are losing their ability to be thankful. Let’s face it. We live in a post-Christian society. Gratitude is basically a Christian concept. I cannot, should not, expect a non-Christian society to adhere to my Christian values; instead I need to model Christian behavior. Grattitude is around us; we just need to look for it in other places beside the shopping aisle. And that’s what I see many people doing on Facebook. Over the last two years, several of my friends have participated in the challenge to post something they are thankful for each day during the month of November. It goes by different names: 30 Days of Thanks-living, the 30 Day Challenge, and others. My friends’ declarations of gratitude have inspired me. One friend even did a “365 Days of Thanks-living” where she posted something she was thankful every day of the year. It’s been a good reminder that thanksgiving is a mindset, not a moment or a day on the calendar. My friends’ posts give me ideas of what I can thank God for. They also remind me that our society isn’t on the brink of total greed yet. There are still a lot of thankful people out there, people who are humbly grateful for the small and large things God gives us every day. Satan loves to deceive and detract us from what is good and lovely. It’s just like his antics to tempt people to be greedy the day after a holiday devoted to Thanksgiving. He’s so sneaky. But he doesn’t have to win. Just because stores are open and offer wonderful deals, just because there are folks who do race off to the stores after the Big Feed doesn’t mean we have to. If we love Jesus, we can keep our minds focused on what is good, we can make gratitude a daily lifestyle. As 2 Corinthians 9:11 promises, we will end up more rich than those who got one of the five coveted ticket stubs from Best Buy or Target for that cutting edge entertainment gizmo. You encourage others to be thankful when you are thankful yourself. So I challenge you. If you are on Facebook, why not join the 30 Day Thanksgiving Challenge. If you aren’t, keep a private Thanksgiving journal. Share it with at least one other person. Starting November 1st, post something every day that you are thankful for. Be specific. Nothing is too small. Don’t forget the spiritual blessings as well as the physical. Look for the ways God is working in your life and proclaim His praise to your friends. 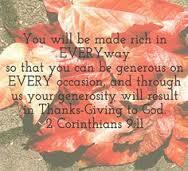 You’ll find yourself much more ready to celebrate Thanksgiving Day with a full and grateful heart. You’ll inspire your friends to do the same. It may even impact how you choose to spend Black Friday. Gratitude – the attitude we need more of. Thanks for a great post! It’s all about our attitude, isn’t it? Thanks for stopping by and I hope you can take the 30 Day Challenge.